President David Granger at a press conference. President David Granger on Friday announced that a search has begun for more cash to make a higher pay offer and stave off an intensified strike by government-employed teachers. “The government is actively searching for fresh sources of funding to satisfy the teachers’ needs,” he said. So far, government’s offer of GY$700 million for salary increases for 2017 and GY$200 million to adjust some salary scales have been rejected by the union. The Guyana Teachers Union is insisting on arbitration now, saying the Labour Department’s role is questionable since its officials have asked the union to accept the government’s offer. He said the Ministry of Social Protection, which is responsible for Labour Relations, was in contact with the Ministry of Finance to ascertain whether more funds could be found. 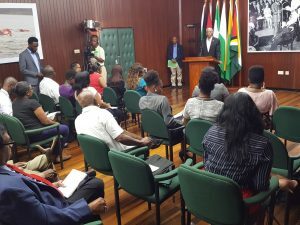 In his third press conference in as many years since he has been in office, the Guyanese leader said government was interested in the Labour Department mediating in the pay dispute between the Guyana Teachers Union and the Ministry of Education. While the teachers union wants government to agree to a multi-year agreement dating back to 2016 and going until 2020, the President prefers multi-year talks should begin now. He wants the now one-week old strike called off to pave the way for conciliation in the current dispute and eventual negotiations for a multi-year agreement. The union wants 40 percent for 2016 and five percent each year until 2020. The President said the planned deployment of retired and trainee teachers was a “bandaid” solution until the dispute is resolved.